As a private DVSA approved vocational training centre, you can be sure to find the support you need from us when it comes to passing vehicle tests. 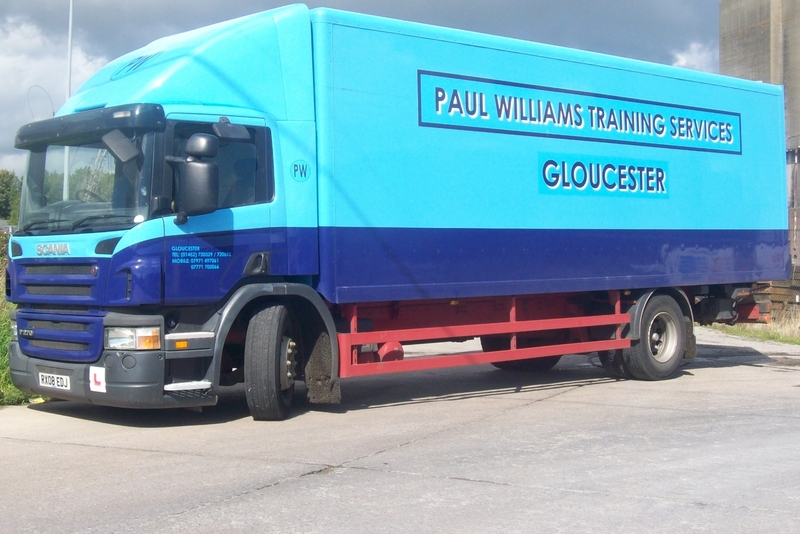 At Paul Williams Training Services we offer a wide range of driver training courses to our customers in and around the Chippenham area, including HGV, LGV, and trailer courses. Our one-to-one training gives you a chance to ask any questions that you may have and feel comfortable whilst learning. We have over 20 years of experience in the industry which has enabled us to build up a fantastic reputation amongst those that have experienced training with us. The vehicles that we use are ideal for learning the skills you need to pass your training and prepare you for your future driving a new vehicle class. At Paul Williams Training Services we have spent the past 20 years developing the course training that we offer to ensure that you get the skills you need. We focus on working closely with you to help you to pass the driving tests, both theory and practical. To book an assessment drive or test with us today, please feel free to fill in our online contact form or give us a call on 01452 720329. With a D1+E licence you will become able to drive any D1 category vehicle with a trailer of over 750 kg attached. These vehicles include those that have 16 or less passenger seats and a maximum length of around 8 metres. The complete weight of the vehicle and trailer cannot exceed 12,000 kg and the weight of the trailer must never be more than the unladen weight of the vehicle towing it. Before starting to train with us you must have the provisional D1, allowing you to legally begin the process. If your license was issued after 1997 then this will not be included and you will need to fill in the forms which we can send to you. When sitting the theory test, both the hazard perception and question sections must be passed before you can sit your practical. The final test will be sat on the last day of your course and will last around an hour and 15 minutes. Alongside our D1+E course, we offer car and trailer courses to help you to tow trailers, horseboxes and more from your vehicle. Known as the Category B+E, the licence enables you to drive a vehicle with a maximum weight of 3,500 kg with a trailer attached. The size of trailer varies depending on when your licence was issued so it is worth checking what you’re are able to tow. A licence issued before 19 January 2013 allows you to pull any size of trailer whereas any issued after this date will keep you to a maximum of 3,500 kg. Passing this will give you the chance to tow trailers, horse boxes and most caravans. When completing your assessment drive with us you can use our vehicle and practice your reversing within our large and specially designed reversing area. Assessment drives give us a great chance to get to know you and your abilities so we can tailor the course to suit your requirements. The final test will assess your ability to drive with a trailer, reversing, awareness and planning, as well as how to uncouple and recouple. The trailer used for our tests is a two axel horse box trailer which has both front and rear tailgates. The tyres and wheels protrude outside the box, giving you good vision whilst towing. The Toyota pickup that we have has plenty of glass windows, increasing vision when reversing even more. Rigid or Category C courses are carried out by our driving instructor Paul who is DSA approved and has more than 20 years of experience. As a JAUPT and RTITB Tacho instructor, you can rest assured that any training given will be to the highest standard. Our centre has a large reversing area, giving you all the opportunities you need to improve you manoeuvring abilities whilst using a HGV. The truck that we use is made by Scania and is comfortable to use. With an estimated population of 45,000, the historic market town of Chippenham has been a settlement since the Roman period and is now seen as a large commuter town for nearby cities. There are plenty of things to do while in the area, including a visit to Chippenham Museum and Heritage Centre, Baydons Wood, and the Neeld Community and Arts Centre. Our trained instructors are able to offer their training including trailer courses to customers in the Chippenham area, providing an easy way to upgrade and gain more driving qualifications. At Paul Williams Training Services we offer a wide range of vehicle training courses to help you to develop the skills and professional qualifications you need. Some of those that we offer include HGV, LGV and trailer courses. For more about our courses or to book a place today, please feel free to call us on 01452 720329 or fill in our online contact form.